My rebuilding focuses on the overall tone quality and playability of the piano.I feel this is the most important criteria of any instrument. 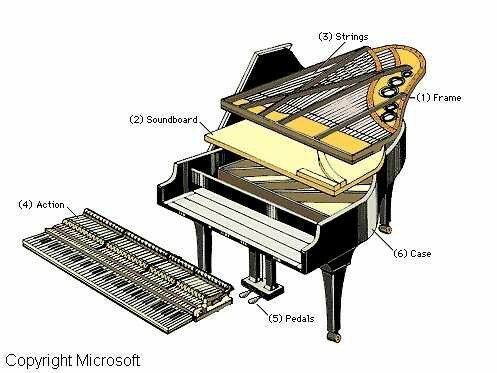 If a piano has good uniform tone and evenness throughout most musicians will feel comfortable performing on it. I specialize in : New hammer installation,hammer voicing ( critical to tone and evenness) ,action regulation,damper and pedal regulating,replacing damper felts, installing new action parts,key dip and keybed adjustments etc. Repairs and adjustments : Reshape and voice hammers , broken hammer shanks and flanges,sticky keys and action ,broken keys,pedals,broken strings,bridge and soundboard repairs and much more. 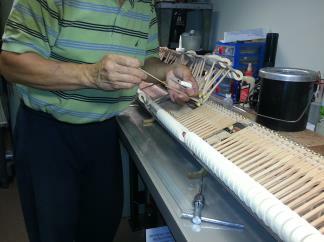 Key recovering service:key whites are recovered with one piece acrylic molded tops with fronts attached. They are beautiful, durable, scratch resistant and will not discolor with age. The TouchRail easily replaces a grand piano's key stop rail to provide a precise level of touch weight reduction to each key.With both macro and micro touch adjustment features, keys can be individually lightened and balanced to bring remarkable improvements to most any grand piano.Each TouchRail is custom manufactured to match measurements taken from the piano. No cutting or drilling is required to install a TouchRail. New German Abel Hammers. Installation being done by John Luca Owner/operator Mastercraft Piano Co.
John Luca owner/operator-Mastercraft Piano Co. Voicing a newly installed set of Hammers.